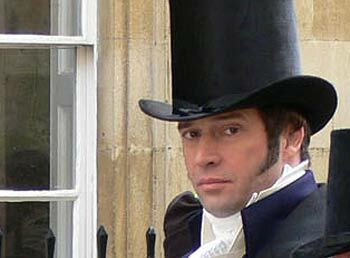 It has come to this Regency author's notice that a notoriously handsome actor named James Purefoy will be playing in a new television drama the man who is credited with having transformed gentleman's clothing into the refined and understated style that's stuck even into the present day: Beau Brummel, dandy and friend of the Prince Regent. Beau Brummel: The Charming Man will broadcast by BBC television on Monday 19th June at 9pm. The programme is an adaptation of Ian King's biography of Beau Brummell. It is the first biography of the great Beau in a generation and is absolutely fantastic -- not the least for the chapter headings and accompanying appendix on how to tie different sorts of cravats. The research is meticulous and provides an insight into among other things the development of men's fashion. It should be a must read for anyone interested in the period. The reason Beau Brummell's last name is spelt Brummell rather than the more familiar and incorrect French version used by his first French biographer-- Brummel -- is that George *Beau* Brummell signed his name with two ls, and how it is hown on his baptism record. You can also see the names of his grandparents graves in St James Church in Picadilly which have the Brummell spelling. Ian Kelly's biography, I think. An excellent volume which I reviewed a while back. I am currently reading Ian Kelly's biog of BB - it is excellent and I am looking forward to seeing the adapatation. Wicked Intentions - would you have the nerve? "A sweet and charming romance"